What is “Task Manager has been Disabled by your Administrator” error? What to do if you see the “Task Manager has been Disabled by your Administrator” error? Learn how to permanently fix the “Task Manager has been Disabled by your Administrator” error, in this blog article. The article will also show multiple ways to get rid of the error message, including aiding you to remove malware if such is triggering the error. If you suspect your computer device is infected, scan your system with a security program. Short Description Viruses, PUPs or other types of malware might cause the “Task Manager has been Disabled by your Administrator” error message to appear. The result is that no user can launch the Windows Task Manager, even if they have full administrative privileges. Symptoms You receive the error message “Task Manager has been Disabled by your Administrator”. You cannot run the Task Manager in any way, including shortcuts, such as “Ctrl+Shift+Esc” and the “Task Manager” option is greyed out from every menu that usually starts it. User Experience Join Our Forum to Discuss Task Manager has been Disabled by your Administrator. The “Task Manager has been Disabled by your Administrator” error message is in actuality quite old and known since the times when Windows XP was popular. Nonetheless, the error is seen in every following version of the Windows Operating System, even Windows 10. The error could be caused by a virus, other form of malware or an application which for some reason switched off the Windows Task Manager module. In the following lines you will see several remedies (which include instructions), to help with every Windows-based computer stop displaying the pesky “Task Manager has been Disabled by your Administrator” error message. Step 4: Double click the “Remove Task Manager” tab and set it to “Not Configured” OR “Disabled” (Both options work). Step 5: Restart your computer or Log Off and Log On back again to apply the changes. 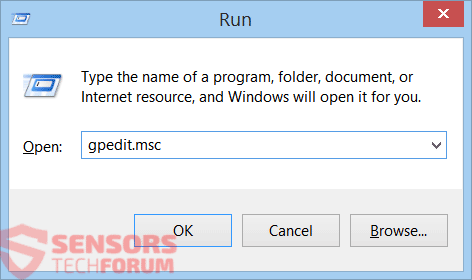 In case you couldn’t run the “gpedit.msc” (Group Policy Editor) try one of the other Fixes below. The Registry Editor should load afterward. Step 4: In the Right Pane, locate the “DisableTaskMgr” registry value. If the value is not there, you will need to create a new DWORD value called “DisableTaskMgr”. Double click on it. A window will pop up. In that window, set the value to 0. Step 5: Close the Registry Editor. If the “Task Manager” is still disabled and you still get an error, restart your computer. You could just run the following registry file to see if you can fix your “Task Manager has been Disabled by your Administrator” error. Step 3: Next, it will ask you if you are sure you want to continue. Click on “Yes” from the dialog box. Note: You can check the file’s content if you right click on the file and open it with a text editor, such as Notepad. 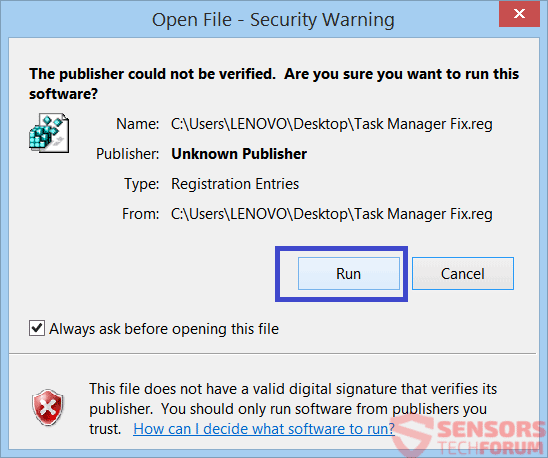 Note: You can skip the following steps if your computer accepts the code directly inside the “Run” window (which was mentioned in the previous Fixes) and press Enter. Step 2: Open Notepad and paste it inside the Notepad window. Step 4: Run TaskManager.bat as Administrator. You should have a running Task Manager and no error message related to it. The “Task Manager has been Disabled by your Administrator” error could be caused by a malware infection, so you will need to remove the virus before expecting any solution to work properly and permanently. Thus, scanning your computer machine with security software to determine whether you have a malware component that is tampering with your computer and triggering the error message is a good idea. We highly recommend that all computer users scan their system for active infections and malware using a security program. That could prevent many malicious actions and stop malware of distributing further. Threats such as Task Manager has been Disabled by your Administrator may be persistent. They tend to re-appear if not fully deleted. A malware removal tool like Combo Cleaner will help you to remove malicious programs, saving you the time and the struggle of tracking down numerous malicious files. Threats such as Task Manager has been Disabled by your Administrator may be persistent on your system. They tend to re-appear if not fully deleted. A malware removal tool like SpyHunter will help you to remove malicious programs, saving you the time and the struggle of tracking down numerous malicious files. Note! Your computer system may be affected by Task Manager has been Disabled by your Administrator and other threats. SpyHunter is a powerful malware removal tool designed to help users with in-depth system security analysis, detection and removal of threats such as Task Manager has been Disabled by your Administrator. 1. Install SpyHunter to scan for Task Manager has been Disabled by your Administrator and remove them. 2. Scan with SpyHunter, Detect and Remove Task Manager has been Disabled by your Administrator. Ransomware infections and Task Manager has been Disabled by your Administrator aim to encrypt your files using an encryption algorithm which may be very difficult to decrypt. This is why we have suggested several alternative methods that may help you go around direct decryption and try to restore your files. Bear in mind that these methods may not be 100% effective but may also help you a little or a lot in different situations. Note! Your computer system may be affected by Task Manager has been Disabled by your Administrator or other threats. 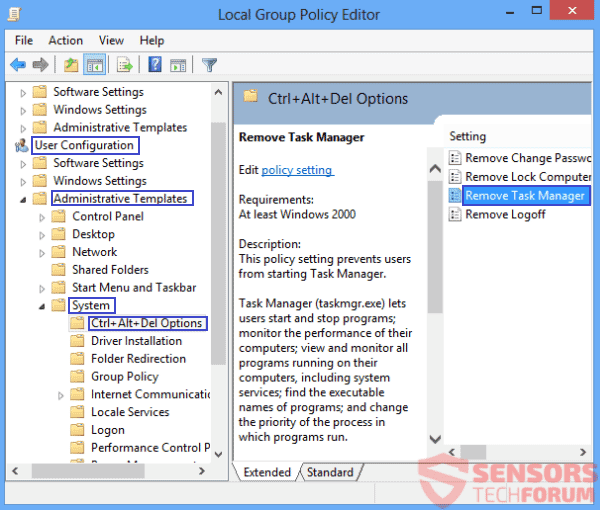 Remove Task Manager has been Disabled by your Administrator by cleaning your Browser and Registry. Fix registry entries created by Task Manager has been Disabled by your Administrator on your PC. Combo Cleaner is a powerful malware removal tool designed to help users with in-depth system security analysis, detection and removal of threats such as Task Manager has been Disabled by your Administrator. Step 5: In the Applications menu, look for any suspicious app or an app with a name, similar or identical to Task Manager has been Disabled by your Administrator. If you find it, right-click on the app and select “Move to Trash”. Step 6: Select Accounts, after which click on the Login Items preference. Your Mac will then show you a list of items that start automatically when you log in. Look for any suspicious apps identical or similar to Task Manager has been Disabled by your Administrator. Check the app you want to stop from running automatically and then select on the Minus (“–“) icon to hide it. Remove Task Manager has been Disabled by your Administrator – related extensions from your Mac’s browsers. A pop-up window will appear asking for confirmation to uninstall the extension. Select ‘Uninstall’ again, and the Task Manager has been Disabled by your Administrator will be removed. When you are facing problems on your Mac as a result of unwanted scripts and programs such as Task Manager has been Disabled by your Administrator, the recommended way of eliminating the threat is by using an anti-malware program. Combo Cleaner offers advanced security features along with other modules that will improve your Mac’s security and protect it in the future. Hey !, I found this information for you: "Fix Task Manager has been Disabled by your Administrator Error". Here is the website link: https://sensorstechforum.com/fix-task-manager-has-been-disabled-by-your-administrator-error/. Thank you.